Made this fresh and light salad for lunch. The addition of cooked prawns will lend an extra crunch to the salad. 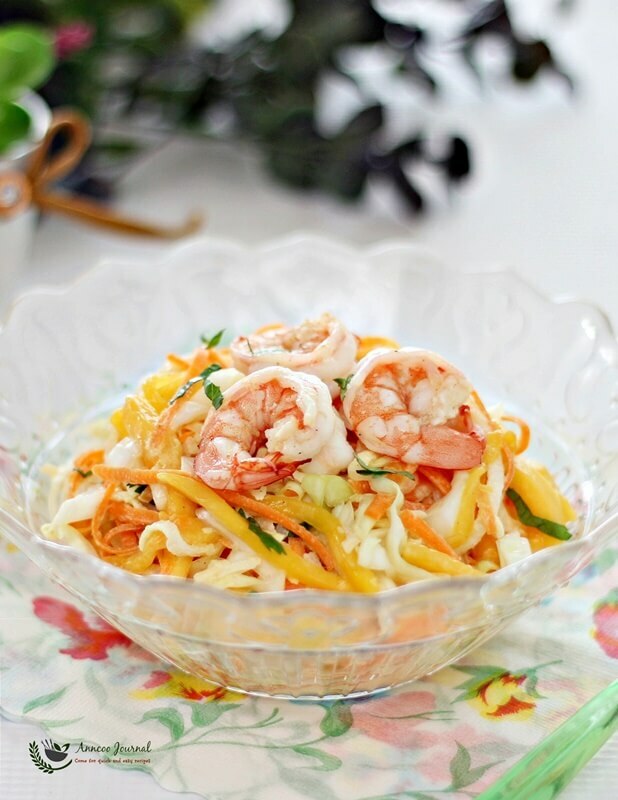 It’s also good to serve this Quick Salad for family day especially in this hot weather. 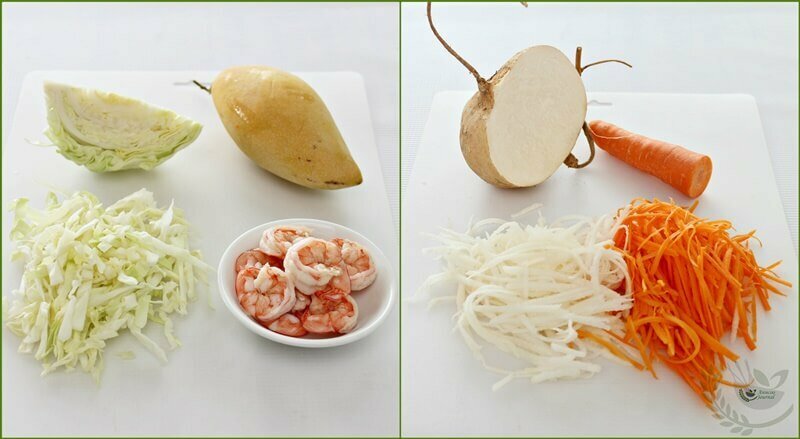 You can prepare all the vegetables and prawns ahead of time and store them in separate containers. Cut the mango just before your guests arrive and toss them all together with mayonnaise and extra lemon juice. 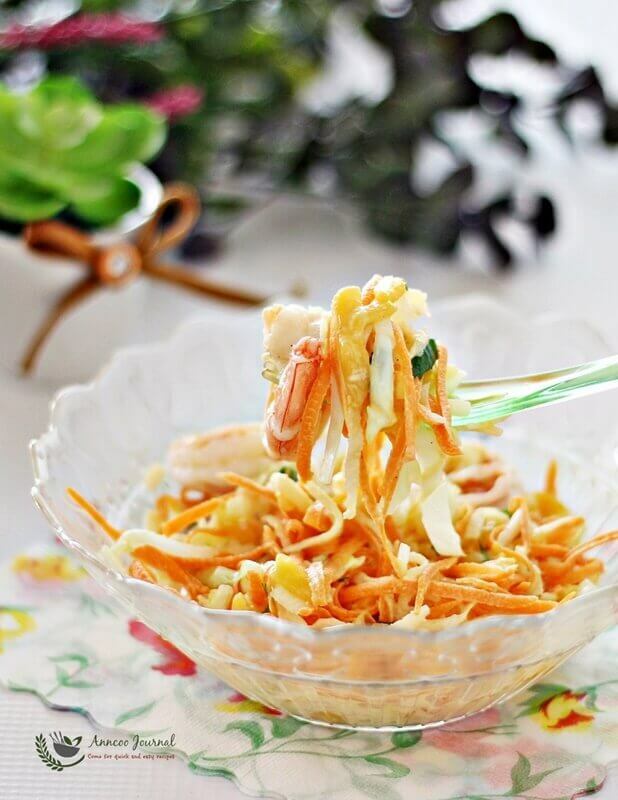 Your family or friends will definitely love this refreshing salad for sure..
Shred cabbage, carrot and turnip. Cut mango to strips. Clean prawns, shelled and devined. Season with a little of salt and pepeer. Blanch prawns in boiling water for 30 seconds or till cooked. Chill vegetables and cooked prawns separately in the fridge for 2-3 hours. Cut mango to strips. 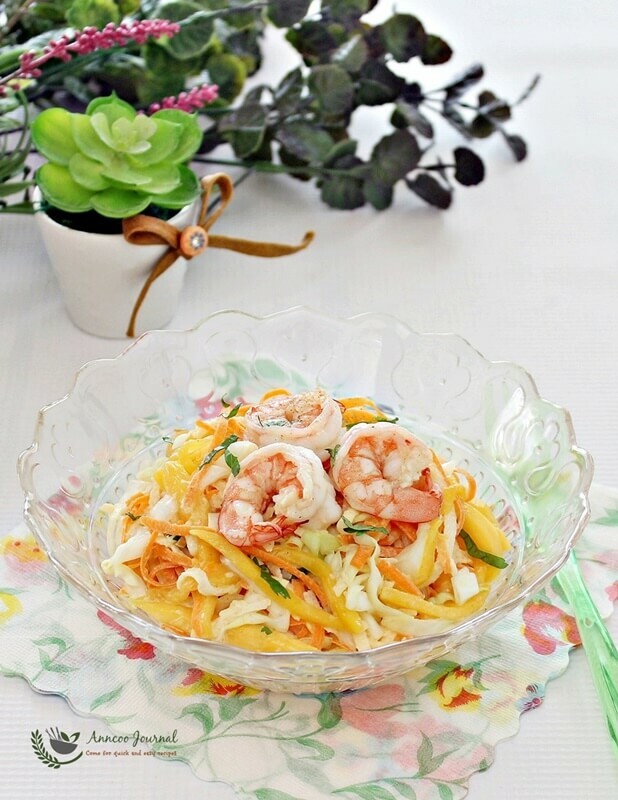 In a large bowl, toss all the vegetables, mango and prawns together with mayonnaise, and lemon juice. Add a dash of pepper and salt or to taste and sprinkle some cut coriander leaves. hosted by Moon from Food Playground at this post. this salad is very appetizing, nice in this hot weather. Love it. Ann, I saw your picture of the chinese turnip on Facebook on the weekend, I think & I was wondering how were you cooking to cook this beautiful piece of vegetable. Great choice to use it to make salad! Love your colorful and healthy salad. All the ingredients are my favorite, like, like ,like! 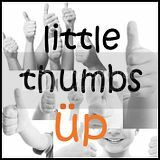 Thank you so much for sharing this to LTU! this is such a crunchy and healthy salad! yum! I am already imagine the crunch from this salad. Yum! yumm!! CAn I have the whole bowl? When I make this salad, it's going to be a meal. Thanks for sharing! Ooh…I want more of that mango:D Looks great! What a beautiful and delicious salad for lunch! Simple, quick and gorgeous…exactly my kind of salad for the dinner! Oh~i made potato salad today! Exchange a bit of your quick salad that looks so tempting!hehe..
Ann, I would love to try this simple and quick salad and have it as my main meal! you know what's thing i like about your blog? everything is so fuss free.. and best, yummy!! !